I spoke to Dale’s mom. Dale was registered at Normal West but he was killed in August 21st and never got to attend. No one from West contacted her. Many people are talking about ways to make sure he isn’t forgotten. His mom suggested a memorial bench at Miller Park or at the Cornbelters field because those were his favorite places. WJBC has a story about a beautiful bench honoring the lives of a student who died and a former student who died – both in accidents and both donating organs. The story claims Normal West and Gift of Hope partnered to create the bench. Click on the link to see it, it is beautiful. 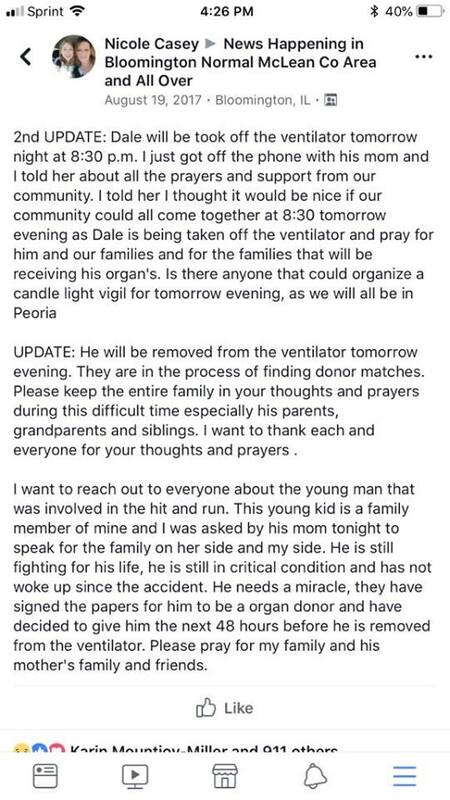 Normal West evidently forgot they had another student who died less than a year ago AND donated his organs: Dale Nelson. He was the bicyclist hit and killed by a drunk driver. Forgot him already? I can only imagine how his family feels today knowing Dale’s life wasn’t important enough to be included. How is Normal West going to fix this one? Posted in BloNo, Local, Normal, schools.Tagged Dale Nelson, Dave Johnson, Mark Daniel, memorial bench, Normal West, Unit 5. Did the family ask about this? Do you know how they feel? Has the school been asked about it? So many questions with no answers. I hesitate to criticize until there are answers. From his obituary, Dale strikes me as the quite, nice guy who doesn’t draw attention to himself. His family and friends chose to hold a prayer vigil without media coverage. There is nothing Normal West can do to change their actions. They won’t… We as a community can fix this. Let’s work together to get a light or a bike bath for kids who live out west. Let’s start a Dale Lights the Way Campaign. GoFundMe campaign? I would ask his parents though. Maybe they wouldn’t want a public memorial. He wasn’t an athlete, so NCWHS doesn’t care. Pretty sad. I like the idea of something Bike related like better lighting or a give away for reflective equipment for bikes. I know stuff like that has been done before but these could have In memory of Dale Nelson connected to it. Just don’t involve Bike BloNo, please. They should not be involved at all, otherwise they’ll spin this politically and use this young man’s death to try to get a bike path installed to congest another road down to gridlock. That is not a problem! Notice how the accident was last August and they haven’t said much if anything? Oh, absolutely don’t let Bike BloNo have ANYTHING to do with this – they’ll dirty up anything they touch. We can offer all the suggestions we want–the mother’s wishes should take priority. The only problem would be getting approval from the City/Town to place a memorial at Miller Park or the Corn Crib. Contacting and working with the Gift of Hope organization would be a start. Slow news cycle this week? Really grasping at straws here to stir up a controversy. My goldfish died last week. Can we throw him in the mix too? Wow, I’m glad he wasn’t your son!